To Help You Prosper To Offer My Expertise Because I'm Real Good At It! More than half of all web visits are now from a mobile device. It's official. It is a mobile web. If not, then you are losing customers as people who come to your site from a mobile device are getting a poor web experience. They have to "pinch and squint" and after a while, they just leave. I can fix that. I can retrofit your site so it automatically re-sizes and reformats the content to accommodate the device of the moment. This is called "responsive design"
Take this site you're on right now for example. If you're on a dekstop computer, just re-size your browser window slowly and watch the page automatically re-size. 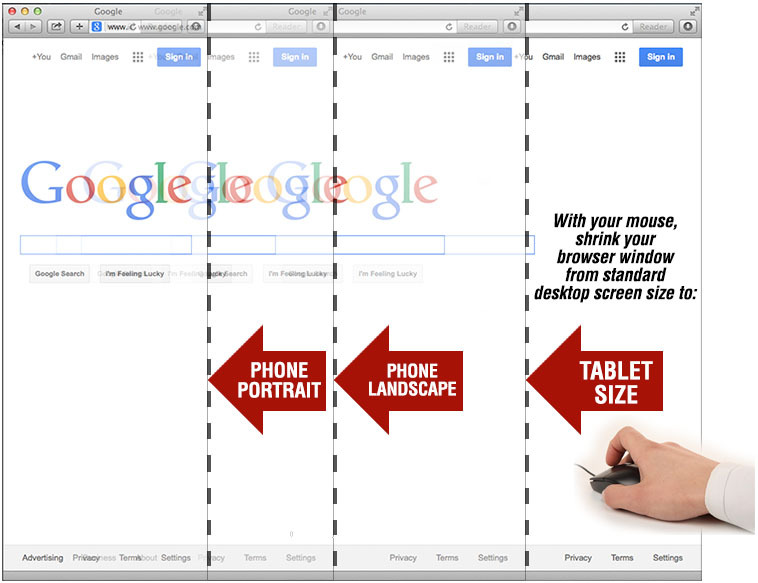 (see "how-to" image below...) First to a size that accommodates tablets... then smaller to a size for a mobile phone in landscape view... then finally to the smallest size for a mobile phone in portrait view. Note too: your site is still the same set of pages, so any edits show up on all views. CALL ME... Call me for a quote on retrofitting your site to accommodate all mobile devices (760) 688-9990.